Genn sends a photo from the Arizona desert. And it’s a crested Saguaro! In Arizona they are saving the Saguaros one RFID tag at a time. (S)eeing saguaros disappear from federal lands, Saguaro National Park came up with a modern solution: radio frequency chips. With the territory so vast and little chance of catching thieves in the act, land managers insert tiny chips into cactus bodies so they can track them down if stolen. “We’ve literally chipped hundreds of saguaros we think are in at-risk areas — the size and location that could put them at a high risk of being poached,” said Paul Austin, chief ranger at Saguaro National Park, who said cactus poaching has declined since chipping began about five years ago. Saguaros are Carnegiea gigantea of course. Named for the Robber Baron Carnegie, they are the only plant in the genus and no one has the courage to move it to another genus of plants to which they are closely related. Of course, most botanists would refer to Andrew Carnegie as a Philanthropist, which might be why they’ve kept the name. I see that a major corporation has decided to use a cactus flower. The flower shown is Echinocereus triglochidiatus which is actually found in the Grand Canyon. Do you think they actually extracted a scent from this particular plant from this particular location? We’ll never know for sure, but at least they got their marketing materials correct. Beautiful striped bromeliads among the orchids high up in the jungle canopy of a Kapok tree, from National Geographic’s Photo of the Day. From the bromeliads, ferns, and orchids that cover a kapok tree 160 feet above the forest floor to the jaguars that prowl below, Ecuador’s Yasuní National Park is home to countless plant and animal species. Click through for the full picture. It’s been a decade since the Center for Biological Diversity petitioned to have this cactus listed. A small, little-known cactus found in Organ Pipe National Monument west of Tucson faces a “high and immediate” threat of extinction, says the U.S. Fish and Wildlife Service in proposing to protect it as an endangered species. The Acuña cactus, topping out at about a foot high, is declining fast, having dropped in numbers by more than 50 percent since 1981, the service said…. The service also proposes to designate 53,720 acres, including 29,500 acres of federal land and 14,266 acres of state land, as critical habitat for the Acuña cactus. That is one very cute little endangered cactus. Cuteness is not the only factor the government considers when reviewing petitions for listing of species, but it doesn’t hurt. While it’s true that you can tend to dig up cacti and move them, this is not going to go as well as the article suggests. Upwards of 800 cholla cactus plants will be dug up to be returned to the area near the Cholla Cactus Garden in Joshua Tree National Park after a road-straightening project is completed. This is one thorny job. So first of all, moving the larger plants will cause a lot of them to lose branches. They do come off rather easily, so a large plant will ennd up being a small plant by the time its put back. Secondly, this is being done in winter when these chollas will be dormant. There will be a lot of root loss, and a lot of the plants won’t come back after that. Interesting! Someone has found a Ferocactus cylindriceus, aka a California Barrel cactus, in Joshua Tree ie in California where they are normally found, and documented it. Fenway Park turned 100 yesterday. For those who stop by the nursery regularly you know I often wear a Red Sox hat which wears out after a few years. So off to Fenway to get a new hat. This one Celtics green. That was Thursday. Here’s from 100 years ago. Exciting news in the world of national park cacti! 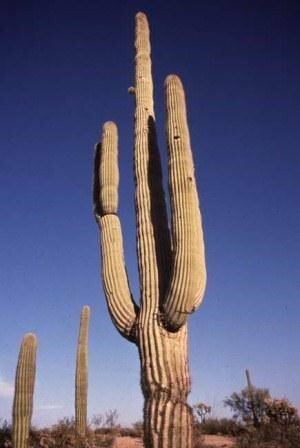 A crew surveying plants at Saguaro National Park west of Tucson has made a “shocking” discovery: a mature organ-pipe cactus growing among the saguaros…. 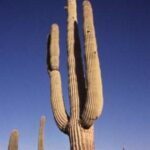 The find is significant because the big cacti – with arms somewhat resembling organ pipes – are almost completely limited in this country to warm, low-elevation deserts at Organ Pipe Cactus National Monument south of Ajo…. The plant is big, but clearly not in its ideal environment. You can see the really pronounced yearly variations in width and the most recent growth is not looking healthy, probably a very cold couple of winters. I wonder what the mountains in the background are called? Do you think they’re called the Spotted French Peaks? And in the deserts of California too. From Desert-USA down in Anza-Borrego. The wildflowers are in bloom at Organ Pipe NM in southern Arizona. I see chollas and organ pipes amongst the poppies.